Pioneers in the industry, we offer asopalav vol-05 designer jam silk suit, designer salwar suit, salwar suit, traditional vol-02 designer salwar suit, ladies suits and ladies semi stitched salwar suits from India. Full Set : 12 Pcs. Full Set : 04 Pcs. This Fashionable Straight Suit in Color Green Top, Bottom Green And Dupatta Green with Heavy Pattern Embroidery Work On It. 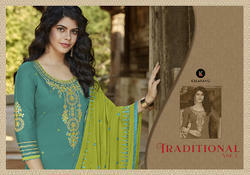 It Contain with Pure Cotton Top, Pure Cotton Bottom And Chiffon Dupatta. This Classic Indian Style Gives Gorgeous Look For Party, Wedding. The offer qualitsative product is strictly tested by our quality experts on various parameters in order to ensure that we provide high grade products to our clients. Slight Color variation May be Possible due to photography lighting, your monitor resolution or picture tube variances. Note: Light colour veriation Can be there in actual Image. Brighten up your look with this season in floral pattern try this out to look stuninig in our social circle. Design brings classiness to your wardrobe. Easy, trendy and enjoyble attire. This designer un-stitched dress material is festooned with excellent printed work that gives a mesmerizing look to the attire. The outfit consists of glace cotton kameez with print neck mirror work, cotton bottom and chiffon dupatta with lace border print. Note:Slight variation in actual color vs. image is possible due to photography lighting. Top:Purple,Bottom:White,Dupatta:White	You will find this season's fabrics are socially with spirit and style to your wardrobe. A masterfully embroiderd shift, exotically patterned dupatta with sophisticated plain designs, season is all about celebrating and bringing out the best in you.This un-stitched dress material consists of purple color cotton cambric top, white color cotton bottom and chiffon dupatta with heavy embroiderd work. Note :Slight variation in actual color vs. image is possible due to photography lighting. This Fashionable Straight Suit in Color Orange Top, Bottom Orange And Dupatta Orange with Heavy Pattern Embroidery Work On It. It Contain with Pure Cotton Top, Pure Cotton Bottom And Chiffon Dupatta. This Classic Indian Style Gives Gorgeous Look For Party, Wedding. The offer qualitsative product is strictly tested by our quality experts on various parameters in order to ensure that we provide high grade products to our clients. Being a quality oriented organization, we are offering a wide array of vary fashionable Embroidered Ladies Suits that are designed as per the latest fashion trends prevailing in the industry. Our entire product range is skin-friendly and long lasting in nature. The offered suits are designed using latest tools and technologies along with the superior quality fabric in compliance with the set industry norms. Moreover, we are offering this entire range at most affordable rate. Be a princess of someone's fantasy by cladding into this ravishing Wear.This Product reach to you as a Outdoor wear Unstitched Chudidar girls fashionable suits with Fabric of (Top: Pure Cotton Weaving Butty,Bottom: Pure Cotton,Duptta: Chiffon with heavy work, Inner:NA),Color of (Top: Black, Bottom:Red, Dupatta:Red ) with measurement of (Top:2.5 Meter, Bottom: 2.5 Meter,Dupatta:2.25 Meter, Inner:NA).100% Genuine Manufacturer Product from Patiala House. Note: While we strive for perfection, there may be instances where product colour may vary slightly due to photographic effects or your monitor settings. Additionally, please note that the props used are not for sale and the styling is only representative..
An inspirational fabrics under the the designer work, is true it's name traditional and for women from all walks of life.This Product reach to you as a Formal wear Unstitched Chudidar fashionable design suits with Fabric of (Top: Pure Cotton Weaving Butty,Bottom: Pure Cotton,Duptta: Chiffon with heavy work, Inner:NA),Color of (Top: Blue, Bottom:Cream, Dupatta:Cream ) with measurement of (Top:2.5 Meter, Bottom: 2.5 Meter,Dupatta:2.25 Meter, Inner:NA).100% Genuine Manufacturer Product from Patiala House. Note: While we strive for perfection, there may be instances where product colour may vary slightly due to photographic effects or your monitor settings. Additionally, please note that the props used are not for sale and the styling is only representative. Brings a whole new range of varity for the most inspiring and colorful ones the world. There's plenty of pretty gorgeous floral prints in exotic color combination. This designer un-stitched dress material is festooned with excellent embroiderd work that gives a mesmerizing look to the attire. The outfit consists of cream color cotton cambric top, red color cotton bottom and chiffon dupatta with heavy embroiderd work. Note: Note:Slight variation in actual color vs. image is possible due to photography lighting. Brighten up your look with this season in floral pattern try this out to look stuninig in our social circle. Design brings classiness to your wardrobe. Easy, trendy and enjoyble attire. This designer un-stitched dress material is festooned with excellent printed work that gives a mesmerizing look to the attire. The outfit consists of glace cotton kameez with print neck mirror work, cotton bottom and chiffon dupatta with lace border print. Note:Slight variation in actual color vs. image is possible due to photography lighting. Unlimited temptation to brighten up your look with an array of floral embroidery that will take you through the season in style. This designer un-stitched dress material is festooned with excellent embroiderd work that gives a mesmerizing look to the attire. The outfit consists of dark blue color cotton cambric top, pink blue color cotton bottom and chiffon dupatta with heavy embroiderd work. Furthermore, a wide range of fabric has been used like embroiderd enhanced by embroidery and thread work which has added a real charm to women clothed in this collection. This un-stitched dress material consists of maroon color cotton cambric top, beige color cotton bottom and chiffon dupatta with heavy embroiderd work. With our in-depth knowledge and experience in this domain, we are engaged in providing a wide assortment of Fashionable Salwar Kameez. Our offered salwar kameez is designed using excellent quality fabric and advanced technology under the supervision of our skilled designers. The salwar kameez offered by us is highly appreciated by our clients for its shrink resistance nature and superior quality. Apart from this, our prestigious clients can avail this salwar kameez from us in various colors, sizes, designs and patterns as per their requirements. You will find this season's fabrics are socially with spirit and style to your wardrobe. A masterfully embroiderd shift, exotically patterned dupatta with sophisticated plain designs, season is all about celebrating and bringing out the best in you. This un-stitched dress material consists of red color cotton cambric top, black color cotton bottom and chiffon dupatta with heavy embroiderd work. This Fashionable Straight Suit in Color Maroon Top, Bottom Maroon And Dupatta Maroon with Heavy Pattern Embroidery Work On It. It Contain with Pure Cotton Top, Pure Cotton Bottom And Chiffon Dupatta. This Classic Indian Style Gives Gorgeous Look For Party, Wedding. The offer qualitsative product is strictly tested by our quality experts on various parameters in order to ensure that we provide high grade products to our clients. Full Set : 10 Pcs.